Talented 3yo Hermosa, a full-sister to Moutonshoek’s exciting G1 winning stallion The United States, is one of 60 fillies who have been entered for the G1 Investec Oaks this May. Arguably the premier classic for 3yo fillies in the world, the Oaks is set to be run at Epsom on May 31st this year. 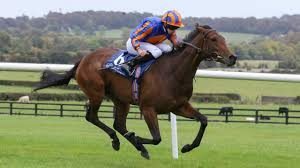 A daughter of Galileo (whose offspring include such Epsom Oaks winning fillies as Was, Minding and Forever Together), the Aidan O’Brien trained Hermosa won or placed in five of her seven starts at two, with her record including a fluent two and a half length win in the G3 Weld Park Stakes. Also runner up in both the G1 bet365 Fillies’ Mile and G1 Criterium International, Hermosa has already banked prize money of over £230 000 –with the promise of more to come! Hermosa, currently second favourite for the 2019 Investec Oaks, also holds entries in all of the G1 Qipco 1000 Guineas, Tattersalls Irish 1000 Guineas and Darley Irish Oaks. The filly is a full-sister to the G1 winners The United States (Ranvet Stakes) and Hydrangea (Matron Stakes, Qipco British Champions Fillies & Mares Stakes), and is one of four group winners produced by the G3 winning Pivotal mare Beauty Is Truth. Her full-brother The United States won 8 times and earned over $2 000 000 in stakes, in a career which saw the chestnut win or placed in 11 group races.